Solid Brick Rambler set back from the street on over an acre! 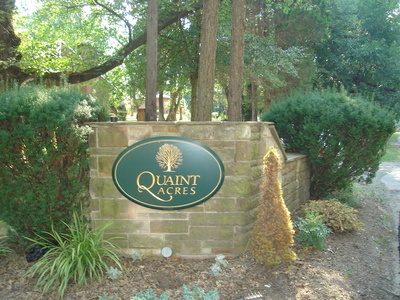 Built in 1956 and located in the popular Quaint Acres Neighborhood of Silver Spring. Spacious Living Room with Hardwood Floors and cozy Fireplace. Formal Dining Room with French Doors to Back Patio. Eat in Country Kitchen. Lucious Wooded Lot. 2nd Fireplace and Bar in Retro Cool Knotty Pine Rec Room! Oversized 2 Car Attached Garage. Quiet Sylvan Setting on a lovely lot close to all the amenities of Revitalized Downtown Silver Spring and only 5 miles to District of Columbia Line and Silver Spring Metro Station. About the neighborhood of Quaint Acres: located off New Hampshire Avenue near White Oak the neighborhood is bordered by Northwest Branch Park. There are 156 Homes. Most were built between 1948 and 1974 and each lot is a little over an acre The oldest home is the original farmhouse built in 1853 where Quaint Acres Drive and Applegrove Rd meet inside the Entrance to the Subdivision. The homes are great examples of custom Mid-Century Modern Houses and no two are alike. This is a quiet, lovely neighborhood, where you can still find homes set back from the street on gorgeous, large, wooded lots, and NO McMansions! what-so-ever.